Planning for a Rajasthan tour that would be embedded with both natural attractions as well as tour to culturally rich places of Rajasthan? The best way to get these attractions embedded in your tour is to visit a fair or a festival in Rajasthan. The Teej Festival in Rajasthan is a perfect place to visit. The fair will not only provide you enough opportunity to have fun and frolic. It will also be the right place to get close to the rich culture of the place. Teej Festival is mostly popular among the women population of Rajasthan. The festival has a great religious significance. The young girls also actively take part in this festival. Married women carry out the various rituals and pray to Goddess Parvati for well being of their husband. They also pray for a blissful married life. The festival holds a lot of importance for the people of Jaipur as during the festival, the pick city gets enveloped in green color. Women in thus part of the world also dress up in colors that signify freshness and richness. Their accessories mainly include colored bangles and jewelry. Decorating the Teej Mata temple is also an integral part of the festival. The idol of Teej Mata is adorned with and traditional jewelry and beautifully embroidered clothes. On visiting the festival, you will also get to hear devotional songs sing by the ladies. These songs are dedicated to Goddess Parvati. The place boasts a different look during the festival as the lawns and the gardens are wonderfully decorated. They are decorated with a number of swings. These swings decorated with strings of marigold and spring flowers. 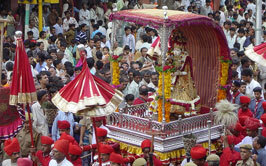 The festival also features a procession with the idol of Teej Mata. The procession terminates at Kanak Vrindavan. It will be a great experience for tourists to visit this place. Book your tour to Rajasthan as soon as possible. Moreover, try to schedule your tour during the time of the Teej Festival so that you get the opportunity to visit this wonderful fair.